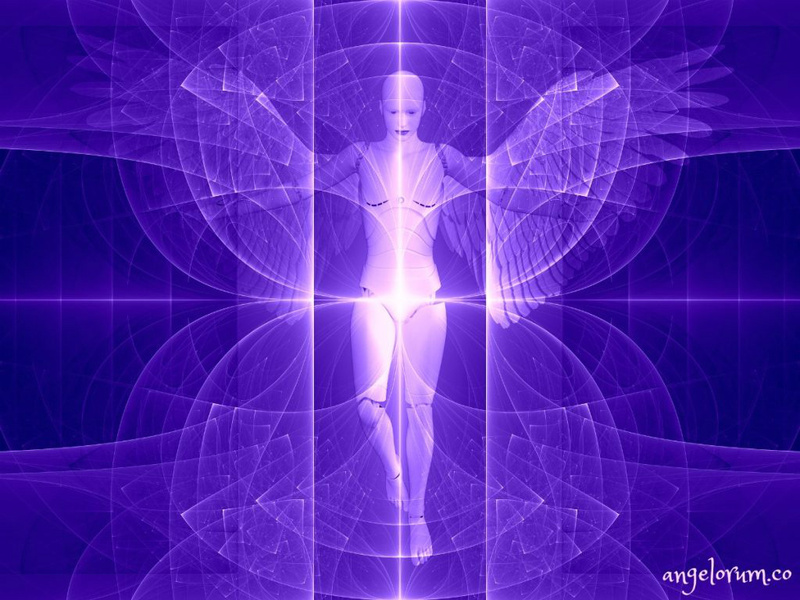 Archangel Jeremiel has a special relationsship to the intricacies of the human psyche. He can be of enormous help for everyone who is suffering from experiences which are traumatic or embarrassing for her or him. He is especially concerned about the fact that our modern minds have sunken so deeply into materialistic thought patterns that we are in danger of not being able to care for our own psyche, which would result in an inability to dissolve negative experiences we have had with ourselves or others, and in all kind of blockages and tendencies towards sickness. Ask me, Jeremiel, to guide you through this meditation. Sit or lie down, close your eyes and let your feelings make themselves at home in the room that surrounds you. Lower your shoulders and send your feelings inside your chin. You shall find how this releases a flow through your entire body. Feel your indignation at the exclusion of intelligent spirituality in the formation of global and local life, and follow what effect this indignation has on you and your relationship to others. Examine how you could help raise the intelligence taking effect between people to a higher level, which would be both more accurate with the truth and more spiritually open. Looking for positive ways of action see your displeasure dissolve and make room for the great breath of life ... of life at the level of absolute honesty and authenticity where thoughts are connected to the heart. Feel in yourself the purest and best you have: the love for the appearance of reality within the truth. Then immerse yourself in the experience of the unfolding of something inexplicable in human love that creates new ground through compassion and grace given from one being to the other. Follow both experiences towards their source and find two wonderful streams coming from the same crystal-clear pond. Dive down into this pond. Find there a heightened clarity about your enlightenment promoting task. Take in all the answers, the imaginations, the methods, the virtues and the strengths you need to fulfill it. Experience it as the right impulse, resurrecting your divine core of humanity: You do not impose anything on others. You just show them how they themselves can come to higher perceptions, how they themselves can invigorate their ability to love - undisturbed by their egos, and filled with the purest extract of joy and bliss. Finally, descend still deeper into the crystal-clear waters of this pond of love and wisdom. There, with my (Jeremiels) help, let everything which still bothers you unfold. Look at it and decide if you still need it as part of your fighting for your identity, and if not... let it go. Breathe deeply feeling how the healing is setting in. Feel the peace of God, who sees through the shadows of the night, as if it were bright day. Allow this peace to sink into each and every cell of your body. Know that I am always with you whilst you let this meditation dissolve. Be blessed... and wake up! Archangel Michael is one of the most important archangels. He is known for his unselfish lightful strength, which is free from all the heavy weight of ego-centered power. His ideas are as selfless and clear as his strength. They are ideas with an inner soul that are deeply connected to the existence of all beings, not like the often soulless ideas of modern science that are the result of experiments and calculations. He carries the seriousness of the world-process within him, looking with deep interest at all our authentic efforts to grasp our divinty. He usually connects with us as soon as we show some of the same qualities ourselves: The selfless courage, the unsentimental will, to stand for the light where it might be unpopular that someome does so. He is so connected to us that each act of true courage in the service of the good in the world calls forth a "Michael-like" picture within our energyfield. And this picture is what Archangel Michael is so deeply interested in. Though his arrival is easy to sense because he is so powerful, he is not an archangel of many words. He likeS to communicate throuGh simpel gestures and his eyes convey messages which are almost like commands. At the same time his whole appearance is so sun-like that his rigorous severity is like enveloped by softening golden light. 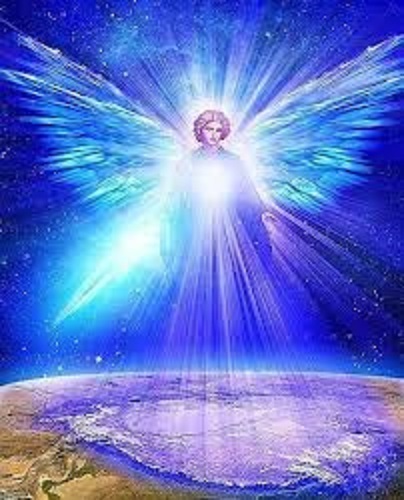 Ask me, Archangel Michael, to be your guide while carrying out this meditation. Close your eyes and imagine that you are inside a beautiful dark blue cave. You follow the light which is sparcely illuminating the cave to its source and find that it is coming from your own heart, which is glowing in a light-blue color. Identify this light-blue light as an expression of the wisdom and all-knowingness of your heart. Anchor yourself within it and breathe deeply seven times. Then remember your path as it was and grasp intuitively that there is a deeper meaning in everything that has happened, including even the unsatisfying, scarry or embarrassing experiences. Look at yourself now and understand: You are at this stage of your evolution following a path that can lead you through solitary landscapes. You have chosen this path, you need to follow it and have remained faithful to it. Know that it is not your fault that you often cannot feel how close we are, that you even can doubt our existence. You are like someone whose will was so strong that he is still going, although he no longer understands the original meaning of it anymore. But... this is your path. Now turn your attention to me. I want to show you why you came, and what you should not leave unheeded on the edge of the way, because what is there is part of the meaning of the way. You must be attentive and you must collect. Take a look at what you have collected so far. And do so regularily. When you feel that you have collected almost all that you need ask me for help. Imagine that I carry you with your whole collection to a place were you are well and feel safe. I shall help you build what you want to build: a cosmic vessel. Not a physical space ship, but an energy structure that can carry you safely through the universe wherever you want, through different planes of existence. With long practice, you will even be able to enter the physical plane of other worlds, but the higher planes are of much greater importance to your world now, and also to the accomplishment of your personal development, the perfection and release of your structure as a person. "I am part of you, great Spirit of Humanity, you fill me with courage, strength and healthy energy. I know that I am most "me" when I am clearing your way. " Then look at me (Archangel Michael). My whole being is like a facial expression of this great Spirit of Humanity. I am his face, that is expressing his divine heart, carrying an unbendable choice to love, igniting an unceasing will to shield and protect where protection is needed. Evolution is the wish of his heart and his acting will, which reveal their essence in me. Look at me and behold this truth. "Beloved Archangel Michael, please make sure, that my love for the Good Great Spirit of Humanity, whom I see revealed in you in his essence, will keep me from falling into the abyss of magical egoisme. Please make sure that I shall thrive, still serving humanity when I shall have reached my cosmic freedom, until all beings which have descended together with me have found the strength to lift themselves up again." Know that I am with you whilst you let dissolve this meditation and find your way back into your normal awareness.